The renowned company Snow Joe has recently launched their new product Sun Joe SPX4001 Pressure Washer with all the cutting edge facilities. Whenever they launch a new product, it becomes a big hit as they come up with the new features and facilities that fulfill the users’ daily need very well. The look of this new machine is very attractive and handy. You might get confused by seeing its size and its power. A question might arise in your mind that how can this small device provide so much power. But it is true that this electric pressure washer has the capacity to provide 2030 PSI water force. This force should be quite enough to clean all your tough residential dirt. This machine will give you around 1.7 GPM water flow and make your house cleaning smooth and effective. The handle is pretty tall, and you don’t have to bend down while carrying the device. You will get 5 nozzle tips and a 20-feet long HP hose that you can easily keep on its storage. After buying the device use 1450 PSI for normal cleaning and 2030 PSI for heavy-duty cleaning. The device has a powerful 14.5 AMP engine to create 2030 PSI water pressure for your tough cleaning. 1.7 GPM water flow will help you to supply enough water through its HP hose. You can use your normal house electric outlet for your power cord, so you don’t need to worry about changing your outlet. You will get 5 quick connect nozzles for your different uses. 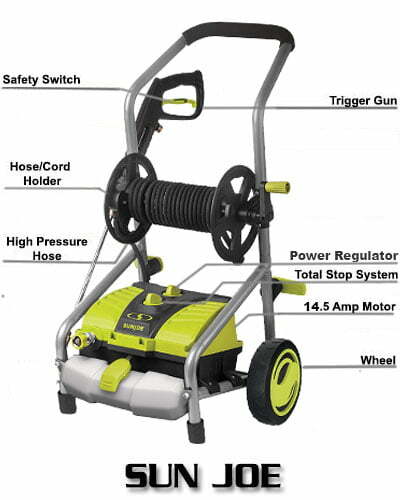 Sun Joe SPX 4001 Pressure Washer has a 35-foot power cord and 20-foot HP hose. Using these two lengths, you can stretch your machine and spray gun quite far from its electric power source. The power cord has GFCI protection. You don’t need to worry about electric short-circuit in a slightly wet ground. 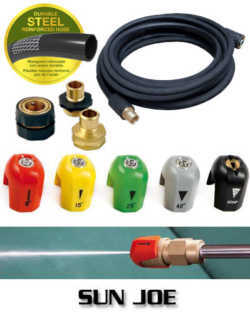 The hose is easily connectable and is kink resistant which provides you the continuous supply of water. The device has TSS (Total Stop System) that actually shuts off the trigger when it’s not in use. You will get a pro-style spray gun that will give you perfect holding facility with a comfortable grip. Holding the gun tightly will prevent any kind of accident and fatigue. You just have to connect it with the HP hose and spray the pressurized water. The shape and size of the device are quite convenient for the users. The dimension is, height 36.4 inches x width 19.33 inches x length 21.2 inches. The total weight of the device after assembling is 32.4 pounds which is not much to carry around. There is an onboard storage for all its power cord, hose and nozzle tips. The hose reel is used for reeling the hose to make the machine tidy. Power: You can use this device for your powerful cleaning such as the oil stain, grease, etc. You can use the 1450 PSI of its entire power to clean the normal dirt and dust and use the 2030 PSI water force for heavy-duty and tough cleaning. The combination of the 2030 PSI water force and 1.7 GPM water flow is perfect for a safe and efficient cleaning. TSS (Total Stop System): All the pressure washers of Sun Joe have this facility which is magnificent for the users. When you are not using the device, it will automatically shut off the engine so that there is no loss of power. This helps save the energy and gives an additional durability. Different Nozzles: For the different use, you need different nozzles. Many machines don’t give you many nozzles which might make you buy extra nozzle. This device will give you total 5 quick connect nozzles which are 0-degree, 15-degree, 25-degree, 40-degree and soap applicator nozzle. Your light, medium and heavy-duty cleaning can be easily done by these nozzle tips. Maneuverability: The machine has two easy-glide wheels for carrying the device to places. You just have to pull the machine holding its handle, and the device will follow you. The weight is not very much, and you don’t need to do gym to carry the device. Warranty: This is a very important facility. Many times we buy products that don’t have warranty facility and suffer later. For this machine, the company will provide you two full years of manufacturing warranty. For any kind of problem, they will always be by your side. For some users, the hose might be a bit short as it provides only 20-foot HP hose. If you face this problem, you can easily connect an extra hose and increase your length. The device is designed to use for residential use. Your commercial cleaning need might not be satisfied by this machine. You might be a new user or an expert in using the pressure washer. For all kind of users, this device is a very good one. Sun Joe SPX4001 Electric Pressure Washer will make your cleaning efficient and effective. You don’t have to spend much of your money to own this machine as they are not very expensive. With the warranty by the company, your investment is protected. Now buy this machine and relax for many years.